Double Braces Mouthguard is rated 4.7 out of 5 by 10. Rated 5 out of 5 by Tammy H. from Good quality product I was very pleased when I received this mouthpiece for my son. He said it's comfortable and stays in place. He is using it for Basketball and Lacrosse. I will recommend this to others. Rated 3 out of 5 by James from Decent The mouthpiece does a great job of protecting your teeth and braces. It sits comfortably on your teeth and in your mouth, but it does take up a lot of space in your mouth. It also makes it hard to breath and communicate with your teammates. Rated 5 out of 5 by richard h. from Braces mouth piece Wish I had this for my older son works great for my little guy he loves it and can breath much better than everyone else we tried ! Thank You !! Rated 5 out of 5 by Anonymous from Great! My son gives it rave reviews. The perfect fit, no boiling to mold. He loves them. 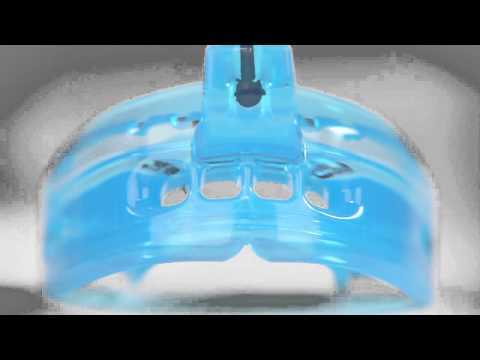 Rated 5 out of 5 by Deanna E. from Mouthguard for braces My 8yo son loves his new mouthguard! The fit is perfect and comfortable over his braces. It gives him the confidence he needs to continue practicing karate without fear of a mouth injury. The cool blue color is a bonus too. The cost is great & the shipping was fast! I will definitely be buying from Shock Doctor from here on out! Rated 5 out of 5 by Rob Q. from Double Braces Mouthguard Had a hard time finding this locally - Shock Doctor to the rescue. Received it in 2 days. Thanx Shoc Doc!